Will you earn more if you vote less? Fourteen years later, on the 7th of May 2018, the financial world woke up on an unconventional call by the market veterans: “Warren Buffett and Jamie Dimon join forces to convince CEOs to end quarterly profit forecasts”, as headlined on CNBC [Ref. 2]. In fact, long term investors are disturbed by the distortions in the investible companies’ long-term values caused by short-term and short-sighted strategies aimed at satisfying quarterly earnings guidance. Every fundamental investor acknowledges the need for companies to build up their processes and systems through time, and these investors believe in the importance of R&D to further develop the products and maintain a solid competitive advantage. On the 27th of May 2018, the Financial Times published an article [Ref. 3] mourning the governance of companies threatened by the dual class structures adopted by technology groups. The article was built upon a set of “expert” opinions out crying the loss of power of investors over the companies they fund, and at the same time, evoking the idea of loss of governance in companies run by insiders. Nevertheless, advocates of the one-vote-one-share system cannot deny, on the one hand, the continuous scandals affecting the listed companies – the list can get so long! On the other hand, they cannot ignore the importance of the insiders’ views. The asymmetry of information has always been described as a potential source of trouble leading to adverse selection and moral hazard. In the former case, insiders selectively disclose information about the company, while in the latter case insiders take on more risk exposure knowing that other investors will be the ones incurring the losses. For example, Elon Musk, CEO of Tesla, disclosed an execution strategy for the new Tesla models that he was not able to accomplish. One can interpret that, as the founder and largest individual shareholder of the company, Musk was driven by an entrepreneurial flair. However, one can argue as well that this is a form of moral hazard, in which the management is exposing the other investors to default risks and somehow deceiving the committed clients due to delayed deliveries [ Ref. 4]. At the same time, it is hard to deny that insiders, and specifically founders, are generally the key players in driving the growth of the business. They are the captain of the ship, knowing all its details and taking it to safe shores. They have a long-term plan for the company, coupled with eagerness to strategically grow and risk what is needed to make the vision a reality. In an ideal world, this vision should be aligned and clear for every member of the company, but the reality is different. The vision of the founders is intrinsic to their own thoughts, to their own emotions and dreams. The information and the views are asymmetric. It is interesting to look at numbers in order to understand the impact of voting rights on the historical performance of share prices. To compare apple to apple, we constructed a portfolio composed of companies weighted by market capitalization with multiple share classes offering different voting rights in the US. The resulting index is benchmarked against the Solactive US Broad Market Index. The timeseries of the two indices are displayed in Figure (1). 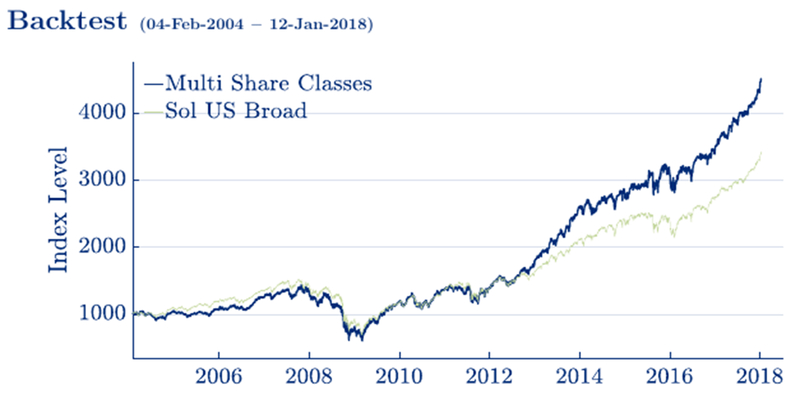 As a first observation, over a window of 14 years historical performance, the portfolio of stocks with multiple share classes outperforms in terms of returns, however, its volatility is slightly higher. Table (1) shows that the returns of the two respective indices are 11.0% and 8.9%, and the corresponding Sharpe ratios are 0.56 and 0.49. Remarkably, from the constituents of the starting universe, only 48 companies had multiple share classes in 2004. This number increased by more than 300% in the last few years, reaching 155 companies at the end of 2017. And NO, contrary to the common belief, these companies are not exclusively in the technology sector. Figure (2) shows that the Consumer Services and the Finance sectors have important allocations in such an index. The allocation to the Technology sector has been increasing with the increasing size of the constituent companies. A closer look at the composition shows the following: first, the top 5 companies had individually outperformed the market by a factor of 2. Second, the leading company is Mastercard, inc., and interestingly Alphabet, inc. ranks only in the fifth position. Third, 61 companies out of 155 outperform the broader benchmark index. As seen above, the numbers suggest that securities with multiple share classes tend to behave better over time than single share class securities. Additionally, the market has seen securities with single share class compensating the investors on the short-term, but risking the company on the long-term. A relevant example is Seadrill, a drilling contractor that recently filed for bankruptcy as the company badly managed the cash reserves prior to the oil’s price crash. On the other hand, Alphabet, inc., a company with multiple share classes, halted a project with the Pentagon after pressure was put on the management internally by the employees and other internal stakeholders. The markets are not black and white, the debate will continue, and so will the opportunities for outperformance.